The New York Botanical Garden in the Bronx is one of my favorite gardens, I even like it more than the Brooklyn Botanical Garden. It’s larger and for much of the park, you don’t see high rise buildings so it really feels like you have gotten away. 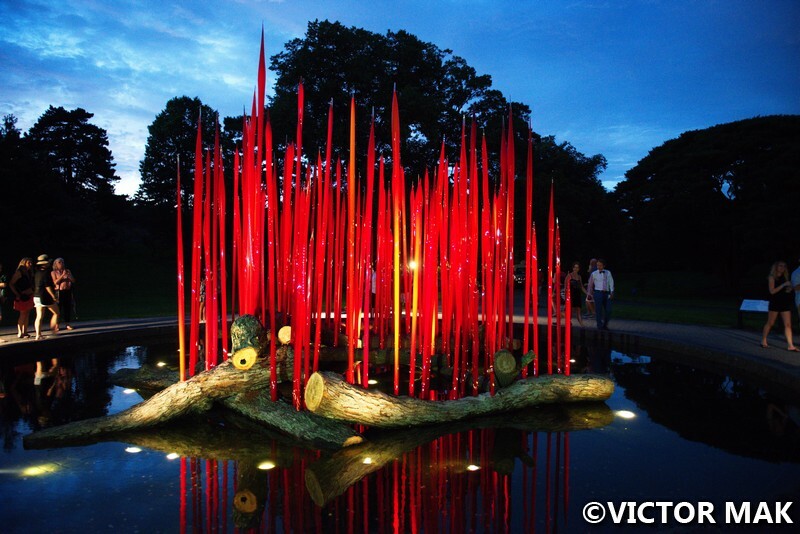 Right now they are featuring world renowned artist Dale Chihuly. It’s his first major exhibition in NY in over 10 years. His works have been here since April 22, 2017 and the exhibit will close on October 29, 2017. The garden stays open late for Chihuly Nights and the glass pieces are really an extra special something at this time of day. I was excited when I read his works were on display in NYC. Researching Seattle lead me to him a while back. Victor and I really enjoy glass works so we were finally motivated to get our lazy asses out of Brooklyn to go to the Bronx, it’s over an hour and a half away from our place and our mass transit has been neglected for years so our transit system has been crapping out. Luckily everything ran smooth the night we went. 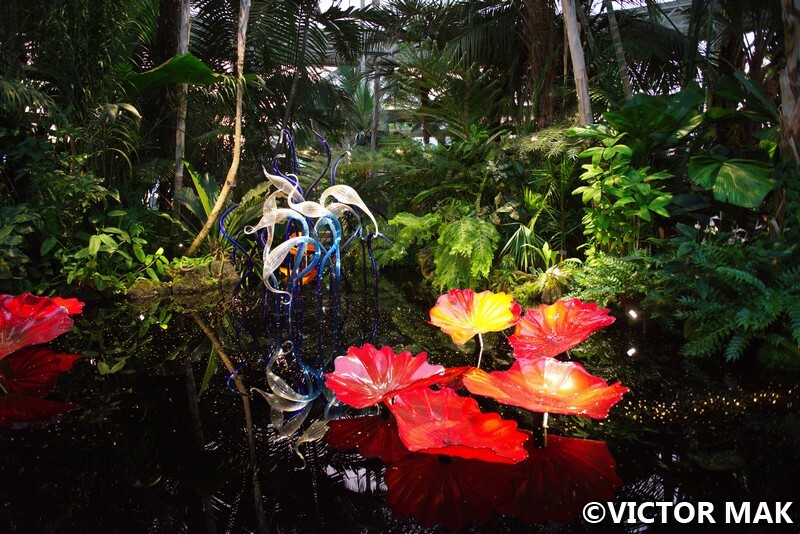 Dale Chihuly was born in Tacoma, Washington in 1941. While at the University of Washington, he was introduced to glass during his studies of interior design. He graduated in 1965 and enrolled in the country’s first glass program at the University of Wisconsin. He went to work at Venini glass in 1968 in Venice after receiving the Fulbright Fellowship where he watched the team approach to blowing glass which is a very important part to his work today. 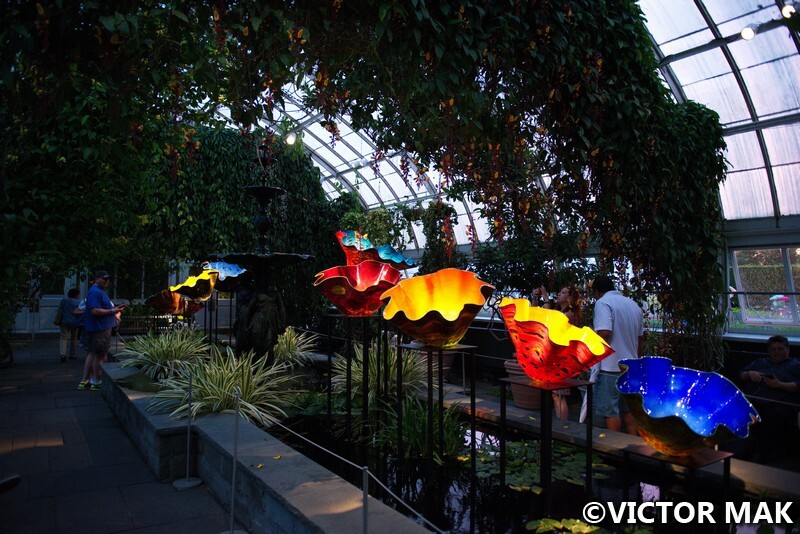 Pilchuck Glass School in Washington state was cofounded by Chihuly in 1971. He led the the development of glass into avant-garde fine art. 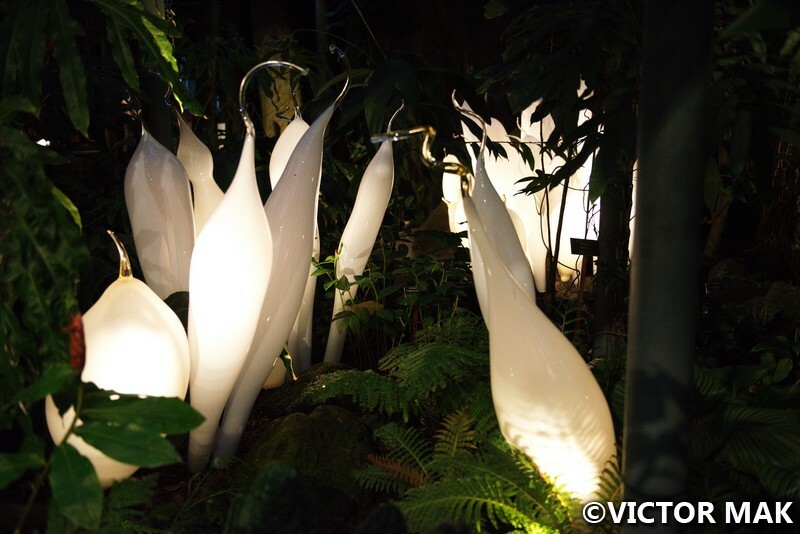 Our favorite pieces were the glass structures that blended into the garden’s plants. They felt organic. 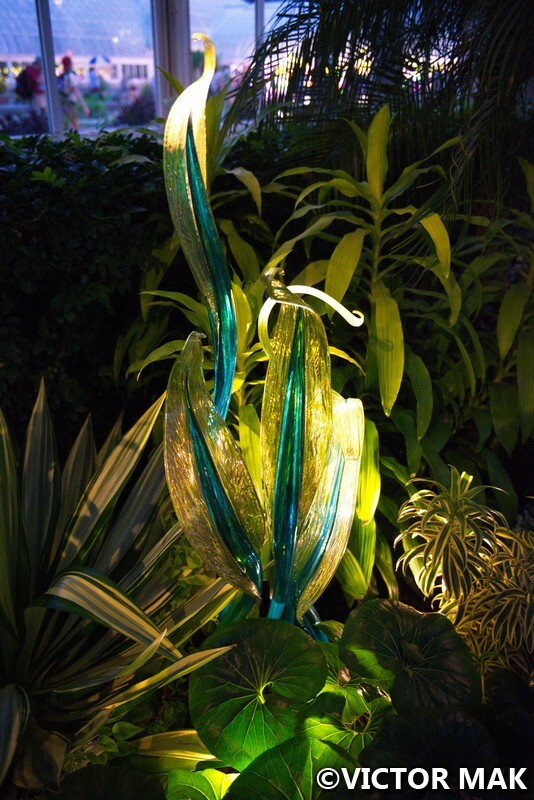 Chihuly’s work is in over 200 museum collections worldwide. He has 12 honorary doctorates and two fellowships from the National Endowments for the Arts. He’s received a lot of awards. 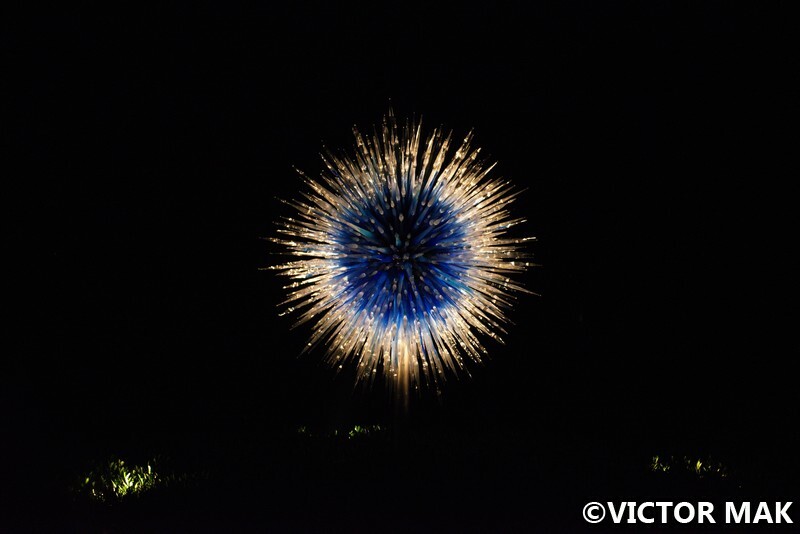 Gardens at night are very special. The sun was setting during the first half of our visit and it added that something to the pieces. The reflections in the bodies of water were pretty. 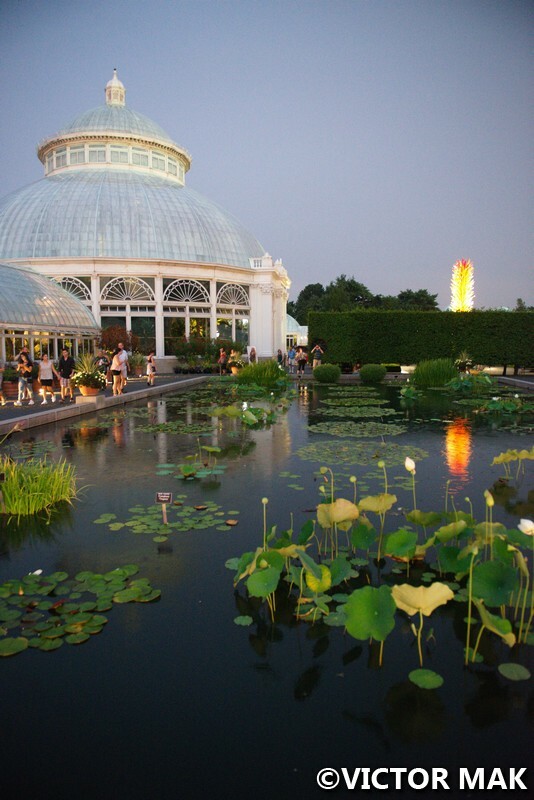 Overall a stunning effect – sunset at the garden. We ate dinner at the garden and for some reason I had to have pizza. New Yorkers are all about our pizza, you can start arguments over “who makes the best pizza.” We like it from the pizza parlor, not Sbarro’s or the fake Original Ray’s. Kinda wanted carbs and you know what, it was not bad pizza especially for garden food. Vic even enjoyed his sandwich. We saw bats flying around, it always feels amazing when you can find and feel nature in NYC. Sometimes it may be seeing a possum at Bowling Green, others it’s a train or bus ride away. The NY Botanical Garden is an oasis in the Bronx. 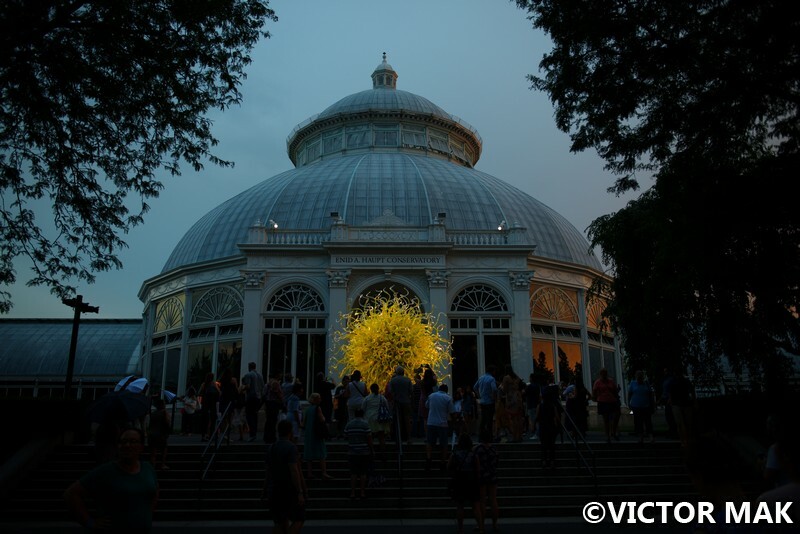 Posted on August 14, 2017 August 15, 2017 by jebusandandrea	This entry was posted in Arts, Gardens, New York, North America, NYC, USA and tagged Art, Dale Chihuly, Gardens, Glass Art, NYBG New York Botanical Garden, NYC Sites, Photography, Travel. Bookmark the permalink. We really enjoyed his work. We will visit the garden in Seattle. I have a travel confession, we do enjoy the tacky tourist stuff even at home from time to time. I really wanted to eat at the restaurant in the Space Needle and it’s close for renovations. It’s also Seattle and the view would be really nice. When I read Warm Bodies it made me want to eat there, part of the story took place in it. I wish I was there to see this show. 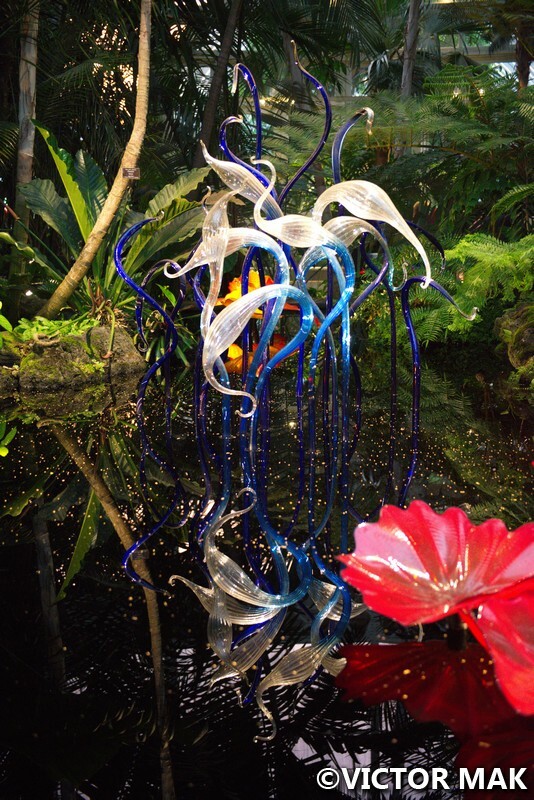 I love Chihuly’s work. 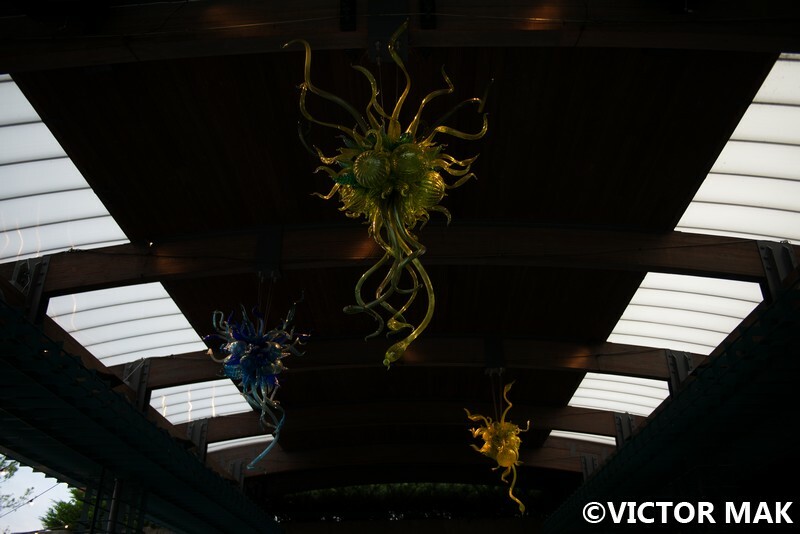 Have you been to the Museum of Glass in Tacoma? Just the Bridge of Glass leading into the museum is a must see; people have told me I should come there at night when the glass is illuminated, but I’ve never been so lucky. New York pizza is pretty unique. I used to think New Yorkers were just being boastful when they talked about ‘their’ pizza, but after having tried pizza at many different places in NYC, I now realize it is different from pizza in, say, San Francisco or Portland or Chicago. Chicago residents get riled up about their pizza, but I’m not entirely a fan of deep dish. I’ve tried Japanese-style pizza with dried squid on top; it’s okay, but not something I’d eat on a regular basis. I do get cravings for NY pizza by the slice, though! We haven’t been to WA yet, we will later this year. We really enjoyed his work. We were lucky it wasn’t as hot as we expected and the trains ran decently. Last night our commute back was tortuously slow because of construction. Glad you like our pizza. We are very surprised by friends that moved here and only eat Sbarro’s to complain about how lousy our pizza is. We tell them that it’s some of the worse pizza and where to go. Do they listen no and they continue to complain about NY. We feel if they got out of their comfort zones, trendy bars, and tried to really get to know the city in a local not superficial they might actually like it. It really drives us crazy when they keep going back to places like Sbarro’s. The brick/coal oven places we tend to call fancy pizzas, they are really good but they aren’t the pizza place around the corner. I’m kinda craving fancy pizza right now. Are you still in Portland? We are having a cool summer and I’m loving it. For the sake of a healthy planet I wish it was a normal hot summer. I’m back in CA. 😦 The weather has cooled down dramatically, both here and in Portland, thank goodness. The heat was beginning to make me ill. I’m all ready for fall and a nice cooling rain. Sbarro’s! That’s school cafeteria pizza! The only time I’ve eaten Sbarro’s was when we were at the Mall of America in MN and nothing in the food court appealed to me, so I had a slice of cheese pizza. I was the only customer—no one else was buying from them—and I found out why. It was just barely tolerable; I ate it only because I hate wasting food. But in a city like New York, it’s ridiculous to eat at a chain. There are all these awesome little hole in the wall places where they serve good, cheap pizza by the slice, and expensive fancy pizza baked in a wood fired oven with organic grilled veggies and meats. When my daughter and son in law lived for awhile in the Upper East Side, there was this place that sold a one-dollar pizza by the slice. (It was plain cheese, but still, so good.) It was owned by a Korean guy who also made an eggplant pizza. Not a dollar, but I still get cravings late nights for that pizza. Anyway, I’m supposed to be on a diet, but I want NY pizza now! Domino’s too. They love Domino’s, we don’t get it. We even said it plain and clear, “You’re eating chain store pizza. Why don’t you go to the places we mentioned?” There’s a fancy organic pizza place we went to a few times with friends. It’s in Tribeca. Wonder if it’s still there. A fantastic place. You chose the right time to see those glass and light works. 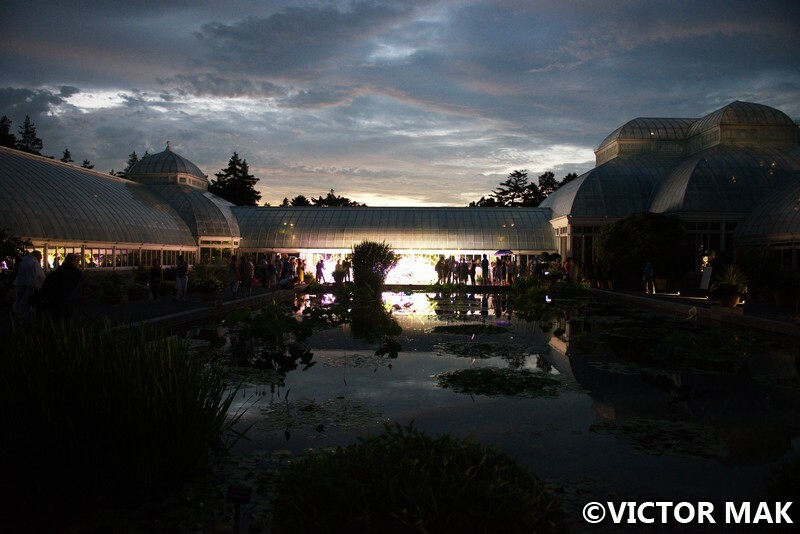 This is the botanical garden for both day and night visits. 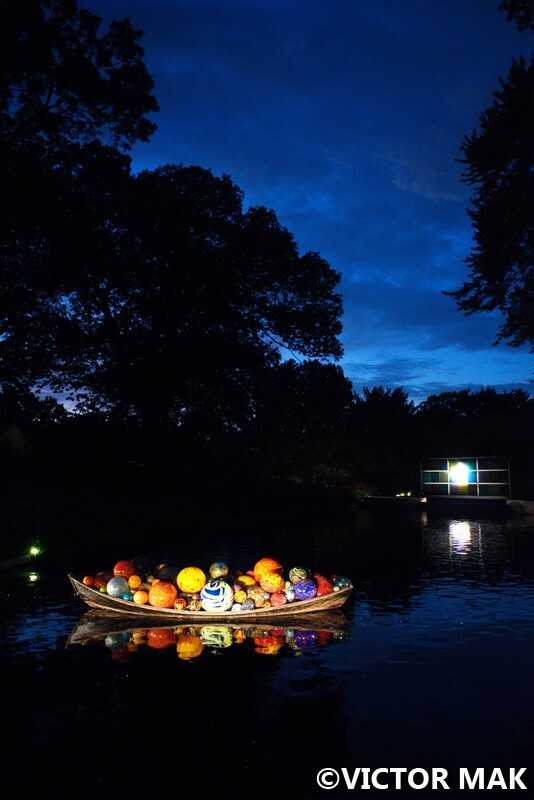 Wonderful photos ~ and I agree with you that the dusk/evening time for Chihuly lights is the best…sets up a great contrast between the work and activities around. Thanks! Can’t wait to see his work in Seattle. 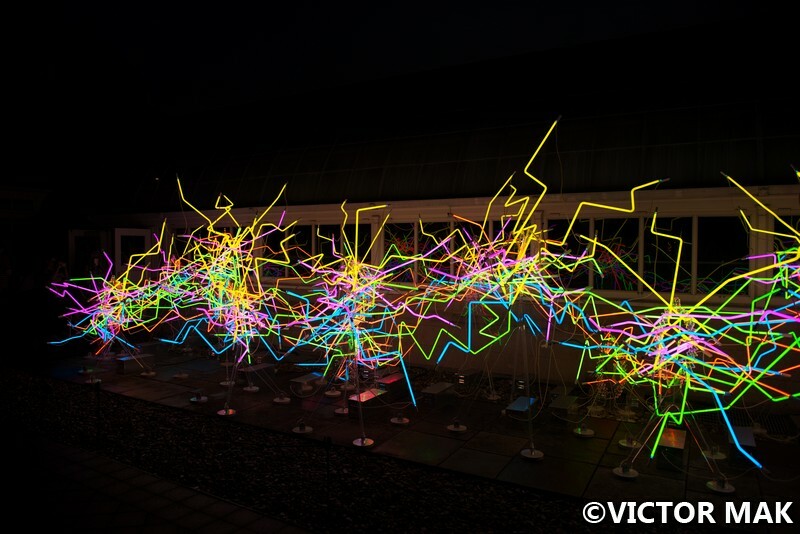 Great stuff – I so enjoyed these artworks when they were at the Dallas Arboretum a few years ago. It is so cool to see them in a new setting. I love how well he integrates the glass with the natural setting. Thank You! We were impressed how natural the glass felt amongst the foliage. We’re headed to Seattle in the near future and will check him out again. 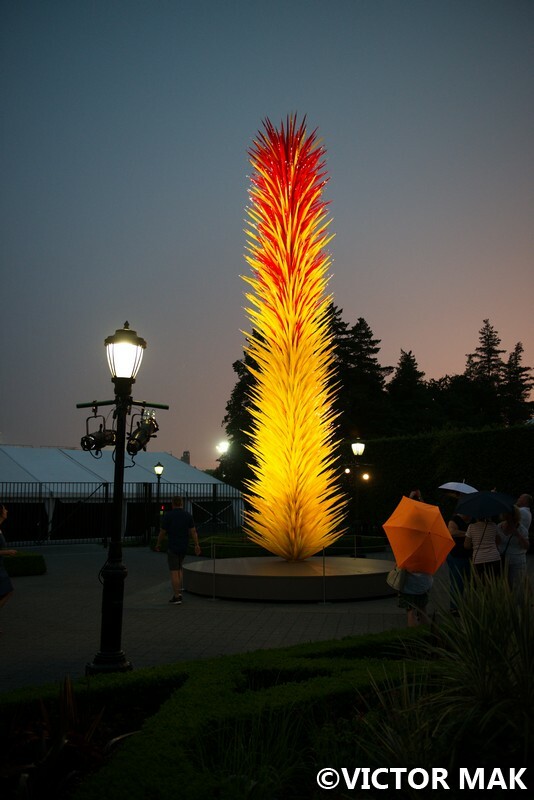 I’ve seen documentaries about Chihuly’s shows on PBS, and a little of his stuff in Tacoma (not the main museum) but haven’t seen what you saw. I imagine seeing it in person at night, all lit up would be extra impressive. I’ll go look for those documentaries. The news is getting to me and I need a break. We were contemplating seeing a show in the Chelsea area until we read that white supremacists are rallying outside Google this Saturday (Google’s in Chelsea). I’ve never felt unsafe in NYC because of my skin. Sorry, I’m still in shock I’m thinking like this in my own city and changed plans. 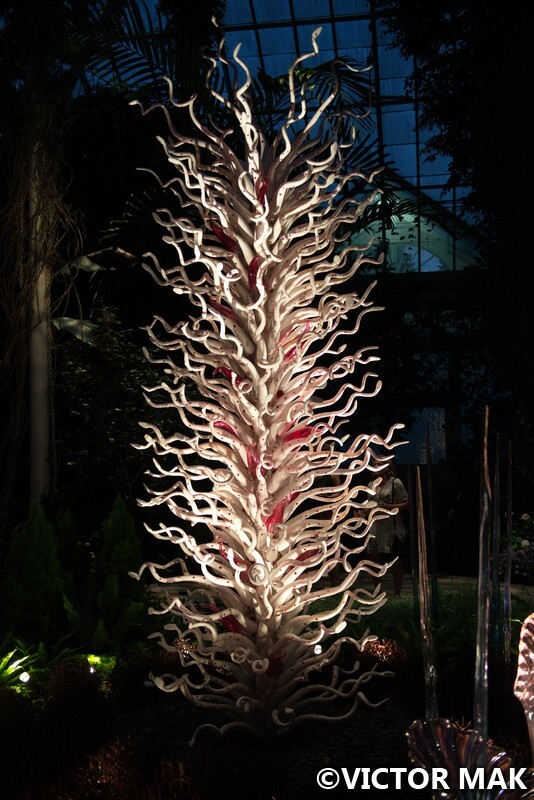 Watching Chihuly’s documentary would be a nice healing break. We rushed the end of the exhibit because the trains didn’t run as often. We’ll try and visit again in Fall. Hope the trees change color by then. There is also a wonderful documentary of Chihuly in Venice…look for that one too. I agree about the news. I really hope it works out for us to meet in Seattle. Hi! Hope it all works out! I’m so excited to meet everyone! Enjoyed an exhibition of some of these works in Kew Gardens, London.